Over the past few days I have been reading George Orwell`s “Down and Out in Paris and London” and have been inspired to discuss my own experiences in a new city and a new environment. I, fortunately, am not as down and out as Orwell was during his time, but I do think I have an interesting topic to write about as I discuss my typical day in London. My in depth descriptions of experiences by no means rival Orwell’s, but I do hope they provide you with a bit more understanding of my life in London. Every event in this account has happened to me at one point or another since September, but not all on the same day. Its 6:29AM Monday morning, I am awake but reluctant to leave the warm comfort of my bed until 6:30 rolls around and “Beethoven’s Fifth” rattles my Blackberry. I get out of bed slowly, and check my phone to ensure that it is in a live zone. The reception in my house is simply awful. The all brick architecture that is so prevalent in the UK is not conducive to cell phones and forces me to rush outside when I receive a call, and to place the phone in certain areas, known to have better reception just to receive texts. As I get dressed and eat my breakfast, my morning progresses at a rather leisurely pace. I am in no rush, for I have not yet been told where, or if, I am working and there is not much I can do until I know. I finish breakfast about 7:35 and just as I am considering lying down for a nap my Blackberry buzzes! A text! I run to my phone and learn where I will be working. I have been assigned to a school in Camden and I have to leave immediately to catch the correct train. As I scramble to gather what I need for a day in the classroom, I take a quick look in the mirror in hope that I look respectable, grab my IPOD, and fly out the door. It is normally a 20 minute walk to Highbury/Islington station, but today I will have to cut that down to about 14 minutes. I have quickly learned the shortest path to the station, and my walking technique is similar to that of an Olympic speed walker. As my journey commences I can’t help but notice it is a cool, crisp day, wind blowing in my face, slowing down my commute. I consider myself fortunate that I remembered my scarf and remind myself that I must buy some gloves as winter creeps in. As I hurry past the tennis courts and the fields of Aberdeen Park, through the picturesque autumnal trees that I don’t have time to appreciate, I run into congestion and have to start making my way through groups of people walking at a snail’s pace, taking up most of the footpath as though they own it. Eventually I make it to within a minute or so of the station when I come to the last hurdle…a roundabout. I take my life into my hands and, with my head on a swivel, I dart between cars coming from all directions and cross the road as swiftly as I can. Before entering the Tube station there is a crucial step to take. Without breaking stride I tread past the pile of free newspapers, grab my copy, and continue on my way towards the train. As I am walking I take my oyster card out of my wallet and get ready to scan it as I dash through the turnstiles. Unfortunately, the person in front of me puts a wrinkle in my efficient, even frenzied, progress as they have no money on their card and are having difficulty comprehending why they are being denied entry. I shuffle my way over to the next line, scan my card, and continue on my way. Through the turnstiles, I enter a sea of people all heading towards the same Victoria line train I aim to catch. I can see that an earlier train has just left so I know that there will be a couple minutes until the next one. I spend these two minutes ensuring that I stand where a door will open when the tube comes to a stop so that I have every chance of getting on the train. This is a little bit of wisdom, a “trick,” that comes from riding the tube every day; many people ahead of me simply stop as soon as they reach the platform, thus losing precious yards and seconds in the race to get aboard before the conductor says; ”Mind the Closing Doors”. As the tube approaches a gust of wind blows through the platform. Being underground can be unbearably hot some days but whatever the temperature this gust is actually quite refreshing. The tube comes to a stop and as passengers exit the train I spend those crucial seconds scoping out a good place to stand (I have no chance of getting a seat). Today, there are no good spots and I will be lucky to get on the train at all! I squeeze on as the last person, missing entrapment in the closing doors by an inch or less. As the train departs I feel rather claustrophobic standing nose to nose with a rotund, middle aged English bloke, sweat beading down his bald head and dripping onto his suit. Judging by the smell of this man’s breath I would wager he had baked beans on toast for breakfast, along with some coffee. I manage to wriggle around to get enough room to at least glance at my paper. It’s tough to actually open it so I just read the front and the back pages full of headlines about the latest gossip and football news. A s the tube continues on past Central London the crowd slowly starts to disperse. I can read the paper with ease. After a quick transfer of trains I reach the tube stop nearest my-school-for-a-day at about 8:15. This is my first trip to the school so I have to put my geography skills to the test. The agency generally provides me with basic directions to the school, but these are often tough to follow as many tube stops have multiple exits. Fortunately I have my London A-Z and GPS on my Blackberry to guide me, and I find the correct streets. On arrival I am required to sign in and am given a four-page document to read about the behaviour management policy of the school. I am informed that I will be teaching year 6 and that school starts at five minutes to 9:00. It is 8:45 by the time I get up to my classroom and I have yet to be told what I am supposed to be teaching the students. There has been nothing left for me, so I run into the next room and ask the teacher there if he can suggest what might be appropriate. Reluctantly, he agrees to help me out and provides me with a worksheet for the students to do during the first hour. At 8:55 I head downstairs to pick up the class from the playground. Part of my job is to make sure that they are in a proper line and are not fooling around. As soon as I start asking them to get into line I am bombarded by students all asking me the same question. “Sir, are you American?” I explain that I will talk about myself when we get upstairs, they cooperate, and we make our ways to the classroom with relative ease. Once I get the students sitting down, I introduce myself as Mr. Wynn and explain I am from Canada, not America. This naturally draws a few snickers and I hear a few kids mutter under their breath “more like Mr. Lose”. Ignoring those comments, I move on and begin with the register. This also leads to great hilarity as I struggle with a few of the names on the list. It is a remarkably diverse class with names such as Tuesday, Princess, Abdullahi, Sumayah, Fatima and Nimrod but I eventually get through the list. Before we move on a couple of hands shoot up and the students have questions for me. I already know what they are going to be, but I have to let the students ask, in case they have legitimate enquiries. As I anticipated, the first question is “do you know Justin Bieber?” and the whole class erupts into laughter. It actually loosens the class up a bit and makes them a bit more comfortable with an unfamiliar teacher. Quickly after register I attempt to transition the class into starting our literacy lesson and ask them to explain to me what they have been working on. I am told by one student that for literacy the year 6 classes actually split into sets based on ability. I am also told that I will be teaching the bottom set. I quickly get the students to head to their appropriate classroom and as other students come in and sit down in my classroom I can see immediately that they are laughing because they have a supply teacher today. Generally kids of about 10 or older see a supply teacher as an opportunity for a day off and particularly enjoy giving the teacher a hard time. It is my job to keep them on task as best I can and to ensure that they do work. I knew that this would be a tough task today, and was I ever right! As I calm the class down and begin the session things appeared to be going relatively smoothly. The kids are listening attentively and seem engaged in the topic, until, all of a sudden, a boy, Michael, jumps up and sprints across the back of the classroom. I stop talking mid-sentence as the whole class turns just in time to watch Michael, his face bright red with rage and his fists flailing, run and punch Robert, a boy half his size and seemingly perfectly innocent. Robert reacts by quickly leaping from his seat and the two boys engage in a full fist fight. As I make my way to the back of the classroom to break up the fight the class erupts in a chant of “fight, fight, fight, fight” to which I have to raise my voice “ENOUGH”. Fortunately I am blessed with an exceptionally loud voice and this allows me to keep control in most any situation. The chant stops immediately and the boys look up at me worriedly, knowing that they are in major trouble. I quickly send Michael to the head teacher with the Teaching Assistant, and I send Robert over to the side of the class to cool off. No sense in talking to him while he is in a rage. It takes a little while for the class to refocus, but eventually I get them working and have a chat to Robert. An eventful morning! As our literacy lesson comes to a close the next challenge is to get the students to line up to go downstairs for recess. This would have been no problem with the original class, but as this is the lower ability set I anticipate it might be an issue. I ask them to line up sensibly and properly. They are year 6, and should be able to do this. As they begin pushing and shoving one another vying for that elusive first spot in the line, I order them to sit back down. We try it again, and again they are forced to sit back down. By this time they have wasted 5 minutes of their 15 minute recess. Finally, on the fourth try, they get it right and we head downstairs. Following recess I head back downstairs to collect a new group of students for Maths. This is the middle set of students which in many ways is the toughest, as the range in abilities is incredibly large. As I set up the lesson and get the students working I notice a boy who is not listening and is not making any effort to get down to work. As the rest of the class begins working I head over to him to ask what the problem is. His response is simply “you can`t make me work, you aren`t my teacher“ He follows this declaration by throwing his books onto the floor and kicking them under his desk. I respond straightforwardly by telling him I am his teacher today and if he doesn`t work I will have no choice but to tell his regular teacher. Reluctantly, the boy nods his head, picks up his books and gets to work. Eventually, the morning draws to a close. By now it is 12:30 and I have the next hour off for lunch. I confidently walk into the staffroom and make myself a coffee, but then comes the important decision of where to sit. I often find that the staffroom is far and away the cliquiest part of the school. All of the teachers sit together at one table, all of the teaching assistants sit at another, and there is usually another table over to the side where the supply teachers sit. Occasionally, if I have had a chat to a staff member I will make an attempt to invade the permanent teachers’ table, usually with odd looks being shot my way in the process, but today is not one of those days. I will sit at the supply table and keep to myself, hastily eat my lunch, then head back to my classroom for the afternoon. Halfway through my lunch I am interrupted by the head teacher, who informs me that I am no longer teaching year 6 today, but instead, I will be teaching year 2 for the afternoon. This is not actually a great surprise to me, as it is quite common to be switched at lunch time, but it does have an effect mentally. Teaching 10 year olds and teaching 6 year olds is quite different and I will have to forget the arduous morning in order to have a fresh start and a good afternoon. The afternoon starts off in much the same way as the morning. Again I am bombarded with questions about Justin Bieber and am forced to explain that I am not his father, his brother, or his biggest fan. The plan for the afternoon is for the class to have PE. As a supply teacher this can be a good or a bad thing depending on whether there is a PE teacher or not. Today there is not and I am forced to think of a PE session on the spot. It turns out I have more time to prepare than I thought, as the kids take an eternity to change into their PE kit. My session is not amazing by any means, but I take the kids through a full warm up and stretch, then play games such as British Bulldog and Everybody`s It tag. This fills the time and the students thoroughly enjoy running around and learning a new game. It is now time for the kids to change back into their school uniforms and get ready to head home! Home time is a very interesting part of the day as each school treats it very differently. Today`s home time routine is a good one, where the students simply sit at their tables, I read them a story and the students leave one by one, with the help of the teaching assistant, once their parents show up to get them . Once all the students are gone I am free to head off for the day, unless there is marking to do. Today there is no marking and I happen to be in one of my favourite parts of London. I decide to go on a bit of a stroll through Camden and the overwhelming amount of markets in the hopes that I can find a deal on anything from clothes to books. One of the major benefits of teaching in a different area every day is that I do get the chance to see different parts of the city and actually get to interact with the kids and parents that live in those communities. As I eventually make my way back to the tube, the atmosphere is a little more relaxed than in the hustle and bustle of the morning rush hour. I get to the station around 5:00PM, just as the afternoon rush begins in London. As I make my way to the train it still feels as though we are cattle being hoarded into a confined space, but perhaps people are not as determined to catch that specific train as they are in the morning. in the afternoon rush it is not uncommon to see a busker playing the saxophone or guitar. Generally they play upbeat rock songs trying to create a positive vibe so that you will give them money. The tube ride home is always much less stressful for me personally, because I know where I am going. The morning is a bit of a panic but in the evening I can relax. I pick up the free evening paper and board my train towards Islington. As we move along the Victoria line we are constantly reminded by tube staff to `mind the gap` and to `mind the closing doors`. As we approach Kings Cross-St Pancreas we hit a red signal and the tube is stopped for a few seconds. Nobody seems to mind too much, but the driver feels the need to come on the intercom and fully explain the problem. By the time he has explained it we are moving! I typically get back to the Islington area about 5PM but I am running about half an hour late today. I now wind down my day the way I wind down most days, by heading for a workout at the gym then heading home to cook some dinner. I will be tired tonight, but tomorrow is another day – another part of London, and more than likely another question about ….Mr Bieber. The last few weeks in London have been nothing if not an incredible learning experience for me. The realities of moving across the world to a big city, a new culture and away from the people I care about the most have finally started to sink in. Don’t get me wrong, I am thoroughly enjoying my new life here and my new opportunity, but there are certainly ups and downs to living in London, which in many ways makes it a far better experience, and probably much more interesting for you the reader. Supply (substitute) Teaching in the UK has both positives and negatives to the work. The work is fantastic for a young, new arrival to London because it is relatively short hours and there is very little work outside of actually teaching. It has allowed me the time to search for a flat and to spend time seeing the sights of London. In fact, teaching has helped me see many of the communities in the city that I might not have otherwise. Areas such as Camden, Hackney, Brixton, Mile End and West Ham are all unique and colourful neighbourhoods that I get the opportunity to visit regularly and as a teacher I actually get to interact in these areas and understand the different cultures. Supply teaching in these communities has been great experience but as I mentioned there are some less glamorous sides to the work. Being on day to day work is something that grows tiresome very quickly. It is frustrating never being able to plan ahead or to be unable to make a good impression by getting to school early. There are occasional days where this is possible, but generally my mornings are quite frantic. It is also rather tough to sink your teeth into the work when you are only there for a day or two at a time. Every day is a challenge, but it is the same challenge. You have to learn the names of an entirely new class every day, learn disciplinary systems of the certain schools, and just make sure that the class is kept busy throughout the day. It is not as stimulating as a permanent job will be, so I look forward to getting into that aspect of my career soon. Teaching has been a major adjustment for me in London. As a trained, but inexperienced secondary school teacher it has been a very strange experience for me adjusting to teaching primary school. I have had the opportunity to teach all ages so far, from reception (4 year olds) to year 6 (10 year olds) and have had to significantly adjust my demeanour and approach towards teaching. Where a high school teacher might be able to joke around with students and talk to them on a much more personal level, the primary teacher must keep be careful, as many students are too young to understand these jokes or will be much more sensitive when challenged. I do think the primary experience will help me with teaching high school however, as I am learning how to manage a classroom for a full day, rather than 50 minutes at a time. As inexperienced as I am the major benefit to teaching in east London is that it is essentially baptism by fire. I am in areas littered with poverty, single parent families, crime and apathy. The teaching is extremely tough to adjust to and I feel that it will set me up for any future endeavours. The importance of learning to manage a classroom is something I have had to learn rapidly – I am no longer the laid back camp counsellor that worked at Marpole Community Centre or the Langara Family YMCA but rather much more of a disciplinarian. I feel I have already begun to evolve and develop as a teacher, but have only scratched the surface as I know that I still have a lot of work to do. While the weeks of teaching are fun in many ways, they are very draining both physically and mentally. In some ways every time I walk into a school it is a job interview so I always feel as though I need to be “on” at all times. The weekends have become my much needed time to unwind and to truly enjoy being with friends, and living in a new city. I do my best to make the most of every weekend here, trying to do as many tourist attractions as possible, but it is a seemingly never ending list! The last couple of weekends have been spent learning my new neighbourhood of Islington and getting reacquainted with the culture of English football. It is nice to have the side of life away from work to keep me appreciative of just what an amazing city I do live in. A pet peeve I have developed in the UK is the unbelievable number of steps you have to go through when dealing with any sort of bureaucracy. Setting up a bank account was one of the more trivial and time consuming processes of my life and currently we are going through a similar struggle trying to set up broadband in our new place. This is an experience I have shared with many other people here who have all had similar stories to share with me. This is oddly not the case with mobile phone companies however, as they are remarkably efficient and the cost of a phone plan per month is very reasonable in comparison to the gorging that exists in Vancouver. Making friends in London is a very cyclical process and has ups and downs on its own. This city is packed with foreigners, like me, traveling on one or two years visas. These people are generally extremely social and up for sightseeing, going to a pub or seeing a show. I have met many of these types through teaching and through other friends. The downside to this all is that they did not arrive at the same time as me, so their visas expire and they leave. I move on, make friends with their friends, but the circle of friends I have in London seems to change from week to week. Meeting locals is somewhat of a rarity as there seem to be very few people actually from London that now work in London. I’m sure they are out there, but they probably don’t spend much time at Buckingham Palace, the Tower of London or the London Eye. I have been fortunate to meet a few English people, and having a cousin so close has definitely helped me become more settled and feel much more at home. As we move into the holiday season there are up and downs to knowing I will be away from Vancouver for a Christmas for the first time in about 15 years. As I have mentioned previously, I am very excited to head up to Yorkshire to celebrate with all of my English relatives, seeing kids eyes light up at Christmas is something I have not seen for years. I am also enjoying the lead up to Christmas in a new city. All over London there are Christmas lights up and outdoor skating rinks are in operation all over the city, and I spent last Friday at Winter Wonderland, a Christmas festival in Hyde Park. At the same time however, being away from Vancouver will be difficult. Not seeing my parents and sister on Christmas is never easy, and missing out on all the Christmas traditions such as carol singing, the Christmas classic hockey game and spending Christmas Eve with my friends will be hard, especially with lots of friends returning home for the holidays. I will do my best to be in touch on a more personal level than this blog throughout the festive season! I write this post not to complain, but rather to show you that it isn’t all perfect in the UK. As I said before though, I think that only enhances the experience. It is the little nuances and quirks that make this such a unique adventure and whether they are positive or negative they are all involved in making up my experiences here. I made a promise to myself that I would be as honest as I could be (restrictions of social media notwithstanding) with this blog and I think this will give you an insight into some of the adversity that I will have to come in the next few months. Hopefully I can succeed with this and continue to really enjoy my time here! When I arrived in London in September I did so with the ambitious intention of traveling widely and visiting all corners of the United Kingdom and Europe. 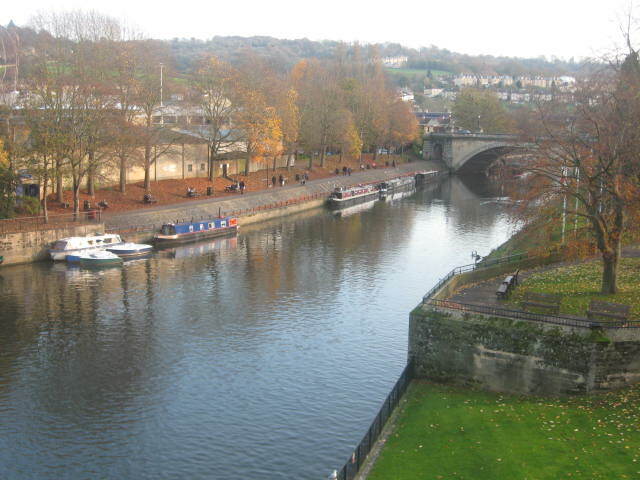 I`ve come to realize this was perhaps a fantasy as factors such as work and finances do interfere with such visions, but I have not completely abandoned this notion and the traveling finally began with a trip to the wonderful city of Bath. An hour and a half away from London on the train, Bath is a city known for its Georgian Architecture. It was left intact following the Second World War and is perhaps the most stunning place I have seen. The buildings have a unique design and it is hard to believe that such incredible buildings could have been designed so long ago. The main reason I chose Bath as my maiden adventure was to visit a friend from my University days, Ron, who is living and teaching at the prestigious Kingswood School in the city. He was waiting for me at the train station as I arrived about 930PM on Friday night and we began the quest to find a late meal as we were both hungry. This proved to be exceedingly strenuous as, while Bath is a beautiful place, it does seem to shut down rather early. Eventually we settled for kebabs from the street vendor and made our way up Lansdown Hill to Ron’s flat. It wasn’t until Saturday afternoon that I really got the chance to see Bath in its true magnificence, but was it ever worth the wait! I was lucky in the fact that I had my own tour guide in Ron to take me around the different hotspots the city has to offer. We set off down Lansdown hill, passing notable attractions along the way, such as the home of Charles Dickens and St Stephens Cathedral. As we meandered down the 2 km road into town Ron pointed out Solsbury Hill, the one made famous by Peter Gabriel. 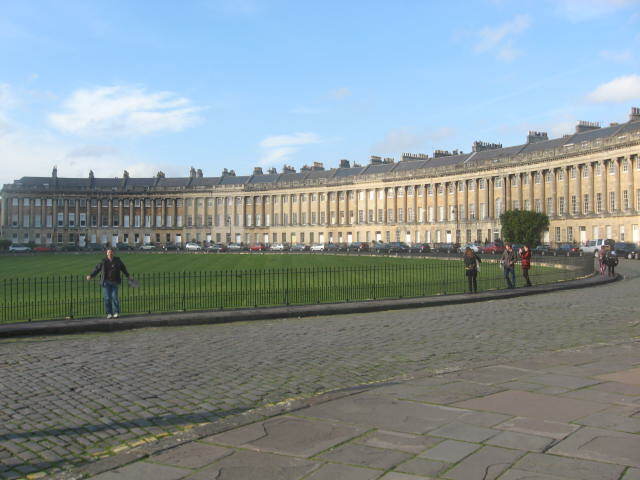 Eventually, we stopped at the Royal Crescent and the Royal Circus for photo opportunities as the brilliant design of the structures is simply incredible. The tour, as is customary in Britain, included a pub lunch and a quick pint before we embarked on the long road back to Kingswood School. While we were at the pub on Saturday afternoon I discovered that Bath Rugby were playing a Heineken Cup match on Sunday afternoon. Ron unfortunately had to work Sunday and was unable to join, but what better way to fill in a Sunday afternoon then to watch a match at the famous Recreational Ground. As Ron reluctantly headed off to work Sunday morning I sauntered into town and made sure that I secured my ticket for the match. 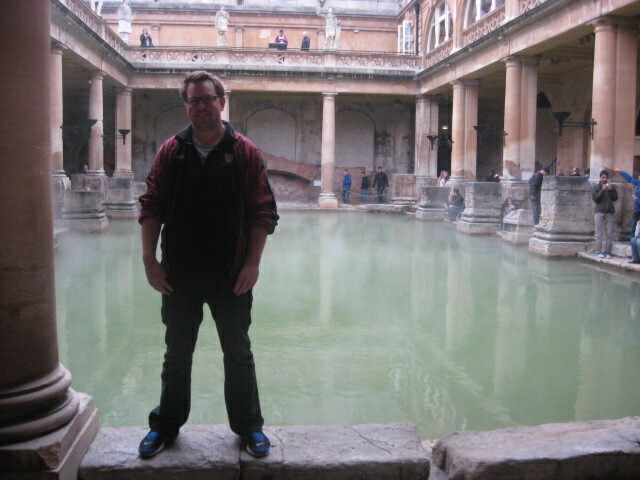 With a few hours to spare and no plan I decided to spend some time getting acquainted with the many Christmas markets around the city and eventually made my way to the Roman Baths. 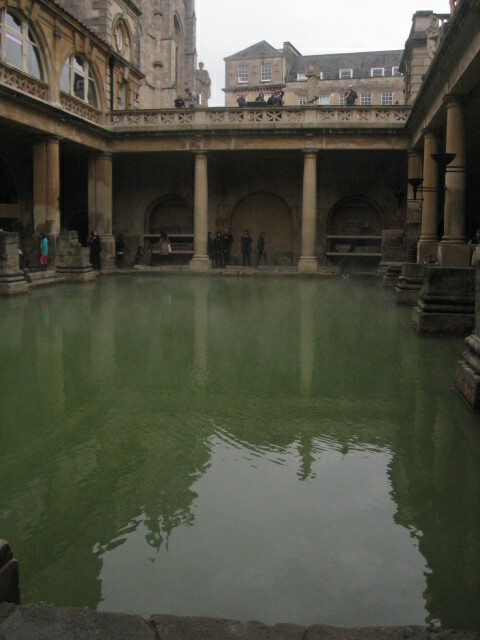 These remarkable hot pools were built with astonishing care and knowledge right in the centre of town, and are surrounded by immaculate buildings. I spent the remainder of my morning and much of my early afternoon browsing the baths then slowly made my way over the `the Rec` for the match. Ordinarily when attending a sporting event I am quite engaged in the action and rarely take time to look at the setting in which the event is being played. 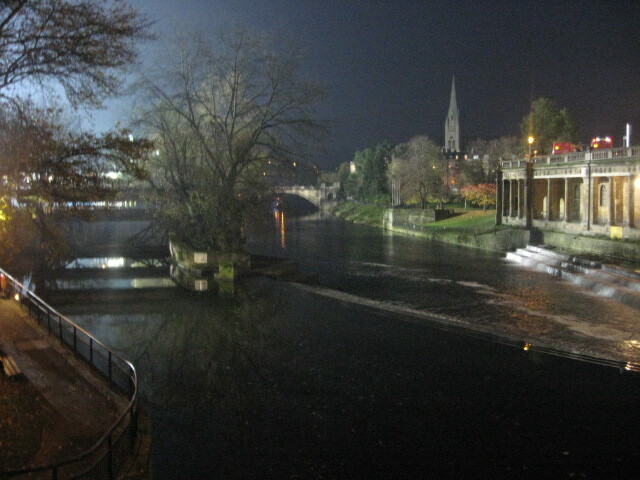 This was an exception, as the rugby grounds are perhaps the best place to get a view of Bath. As I sat in my seat, well before the game began, I was awestruck by the view of the Georgian Architecture surrounded by beautiful English countryside. As the game progressed the sun began to set and this only made the setting all the more picturesque as the sky adopted an orange glow and the lights of the city became more prevalent. 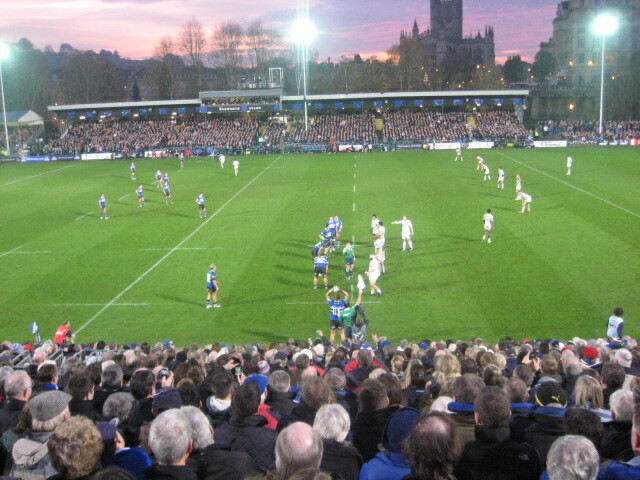 The atmosphere for the rugby match was perhaps the best I have seen. I found myself sitting in between two longstanding members of Bath Rugby and was able to learn a lot from them about the club and the history of Bath. In return they engaged me in conversation about Canadian rugby, and eventually New Zealand rugby as they got more information about my travels. The match itself turned out to be one of the better live games I have seen, going down to the final seconds with a failed drop goal attempt preserving the win for the home side. As is usually the case with rugby the atmosphere was friendly and relaxed, and the French visitors from Montpellier were welcomed with applause as French wine and bread was served at the concession stands; a far cry from the culture of English football to be sure. The weekend in Bath was a much needed break from the fast paced life of London and I am very thankful to Ron for inviting me up. It is always a pleasure to see a different side of England and I look forward to this again in the coming weeks as I am heading up to Yorkshire for the holidays.